That’s one reason why I am so happy to be participating in the University’s Student Science Research program. 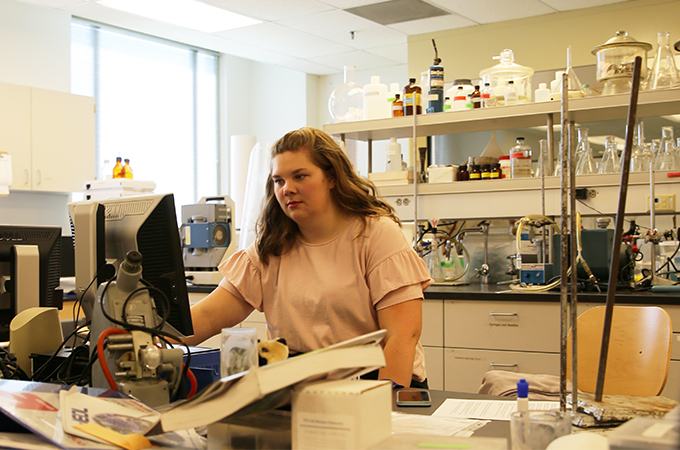 Thanks to support from the Larry and Rita Seratt King Endowment for Student Science Research, I have the opportunity to spend all day in the lab and really make progress on my research! The experience will also be a big plus when I start applying to Ph.D. programs in biochemistry or organic chemistry, which, since I’m a senior, I plan to do this fall. Professors Dan Wacks and David Soulsby have been my mentors at Redlands. Not only have they guided my research, advised me on classes, and taught me hands-on laboratory techniques, they have been endlessly patient answering all my questions about graduate programs! In the lab this summer, I am continuing a project I started last year: determining the carbon hierarchy for a bacterium called Sinorhizobium meliloti. This means I am trying to determine which carbon source S. meliloti prefers to consume. This research has real-world implications. S. meliloti is a model organism for a class of bacteria, rhizobia, that tend to form symbiotic relationships with legumes; the bacteria transform atmospheric nitrogen into ammonia, a form of nitrogen the legume can consume. This relationship is extremely important because legumes make up a large portion of the crops in the United States. Determining the carbon hierarchy could help reduce farmers’ reliance on environmentally harmful nitrogen-rich fertilizers. I will present my research at the U of R Student Science Poster Session on September 26 and as part of the chemistry major’s research requirement in the spring. I’ve also applied to present my work at a Southern California Conferences for Undergraduate Research gathering this fall. It’s going to be a busy year! As a senior, I will also be president of Mortar Board (an honor society for seniors), vice president of honor society Omicron Delta Kappa, co-president of the Chemistry Club, and member of Alpha Phi Omega (a national Greek organization focusing on community service) and Phi Sigma (a biology honor society). The one-on-one interactions with professors, generosity of donors, and strong sense of community at the University of Redlands has opened so many doors for me! Redlands has been everything I hoped for and more.